MONTREAL, July 5, 2018 — In a novel approach to invisibility cloaking, the frequency of light waves is manipulated as the light passes through a target object. 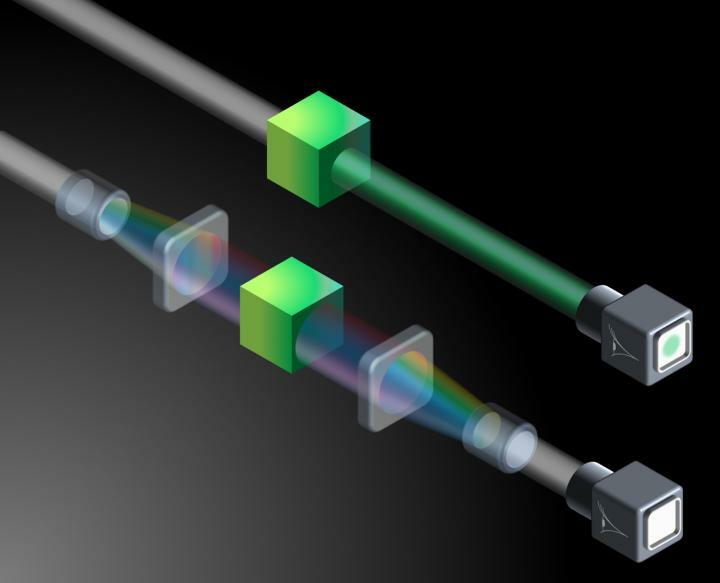 Called a spectral invisibility cloak, the new device can completely hide objects under broadband illumination, allowing full-field broadband invisibility. A broadband wave illuminates an object, which reflects green light in the shown example, making the object detectable by an observer monitoring the wave. A spectral invisibility cloak transforms the blocked color (green) into other colors of the wave's spectrum. The wave propagates unaltered through the object, without ‘seeing its color,’ and the cloak subsequently reverses the previous transformation, making the object invisible to the observer. Courtesy of Luis Romero Cortés and José Azaña, National Institute of Scientific Research. Most solutions for invisibility cloaking involve altering the paths that light follows so that light waves propagate around, rather than through, an object. To develop a cloaking device that allows light to pass through a target, researchers at the National Institute of Scientific Research (INRS) devised a way for the light wave to propagate through the object without actually “seeing” it. The spectral cloak selectively transfers energy from certain colors of the light wave to other colors. The redistribution is customizable and reversible; after the wave has passed through the object, the cloaking device restores the light to its original state. First, the device shifts the colors toward the regions of the spectrum that will not be involved in propagating light through the target. For example, if the target reflects green light, then light in the green portion of the spectrum could be shifted to blue, so that there would be no green light for the object to reflect. Then, once the wave has cleared the object, the cloaking device reverses the shift. “Our proposed solution avoids this problem by allowing the wave to propagate through the target object, rather than around it, while still avoiding any interaction between the wave and the object,” Cortés said. The team demonstrated its approach by concealing a broadband optical filter from detection using a phase-coherent light pulse of 500-GHz bandwidth and then showing full restoration of the temporal and spectral profiles of the pulse. Commercially available components were used to build the device. The first component, a dispersive optical fiber, was used to force the different colors of a broadband wave to travel at different speeds. The second component, a temporal phase modulator, was used to modify the optical frequency of light, depending on when the wave passed through the device. Researchers placed one pair of these components in front of the optical filter and the other pair behind the filter. The cloaking device was able to transform the light waves in the range of frequencies that would have been absorbed by the optical filter and completely reverse the process as the light wave exited the filter. Essentially, the cloaking device made it look as though the laser pulse had propagated through a nonabsorbing medium. Researchers demonstrated spectral cloaking when the object was illuminated from only one spatial direction, but Azaña said it should be possible to extend the concept to make an object invisible under illumination from every direction. The team plans to work toward this goal. In the meantime, it is also working to advance practical applications for single-direction spectral cloaking in one-dimensional wave systems, such as for fiber optics-based applications. The spectral cloaking approach could be applicable to securing data transmitted over fiber optic lines and also could help improve technologies for sensing, telecommunications, and information processing, researchers said. The overall concept of reversible, user-defined spectral energy redistribution could also find applications beyond invisibility cloaking. For example, selectively removing and subsequently reinstating colors in the broadband waves that are used as telecommunication data signals could allow more data to be transmitted over a given link, helping to alleviate bottlenecks as data demands grow. The research was published in Optica, a publication of OSA, The Optical Society (doi:10.1364/OPTICA.5.000779).